In this tutorial we will download and install the programs we need to do java development. We will be using the Eclipse IDE (Integrated Development Environment). 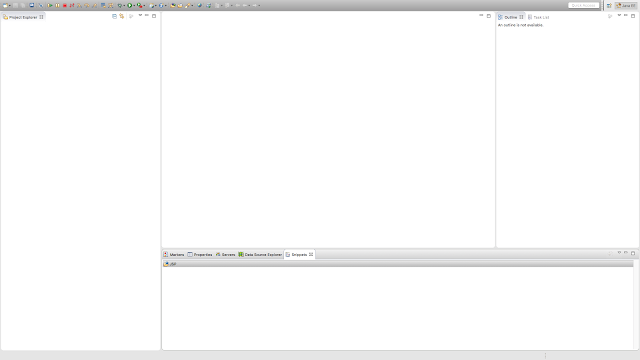 Eclipse is a software tool which we can use to write, test and run Java code. You can download it from http://www.eclipse.org/downloads/. The one you want is the Eclipse IDE for Java EE Developers. This will give you a ZIP which you then need to extract onto your desktop. Within the extracted folder will be the eclipse app. Don't open this yet, first we need the JDK! The latest JDK at the time of writing (February 2016) is version 8. This may be different when you read this. You can download the JDK from Oracle's website. You need to accept the agreement and then download the package suitable for your OS. Follow the instructions to install the JDK. You can choose any location for this, this is where your files will be stored. Once Eclipse has loaded you will have a Welcome screen. Close this screen (near the top right of the window there will be a welcome tab with an X button). You should now have a main window with a pane on each of the left, right and bottom of the screen. The pane on the left is the Project Navigator, which should be empty at the moment. This is where your files will be once you have some! That's it for this tutorial, next time we'll start some code!